Wayne and Sherri Connell discovered all too quickly that living with debilitating illness is not only a struggle physically and financially, but it can also bring challenges to relationships. Sherri had always been a very active and goal-oriented person. Her first job was at the age of 10, caring for several horses in a stable. Later, she worked at a pet store at 13 and a clothing store at 14. She was a cheerleader, pom pom girl, sang and danced in musicals, acted in commercials, modeled in fashion shows, rode her horse and lifted weights. She also put herself through college, obtaining 2 Bachelor Degrees and a Minor in Liberal Arts. Sherri never knew why at the time, but she had health issues starting at the age of 14. Although she experienced fatigue, headaches, recurrent infections, bouts with fevers and paralysis, she never let her symptoms get in the way! She was determined to stay active and follow her dreams. However, at the age of 27, just as she was starting her Masters Degree, she was suddenly stopped in her tracks. She was paralyzed from the ribs down, could barely sit up and hospitalized for a week and then diagnosed with Progressive Multiple Sclerosis. This diagnosis did not scare her, as she was accustomed to rising above her pain. Thus, she figured she would get a couple of weeks of rest and be back to her life! Nevertheless, Sherri never recovered enough to return to work or even to care for her own daily needs. Sherri continued to mourn the loss of those things in her life that gave her great joy. Still, the most hurtful part of her illness was the lack of understanding among friends, family and even strangers. Trying to explain how her life had changed and what she had lost to people was not only draining, but also frustrating for Sherri. It seemed to her that no matter how hard she tried, people always told her, But you LOOK good! Sherri didn’t mind a compliment, but what they really were expressing was their difficulty believing that what she was enduring was really as bad as she made it sound, since she didn’t look sick or disabled to them. Later, after Wayne and Sherri were married, Wayne suggested she share some of her writings from her journal on the internet so that friends and family could better understand what she was going through. Instead of trying to explain it to people, her husband said she could just tell them to go to the website! Expecting just a few loved ones to visit the site on occasion, Wayne and Sherri were shocked when the emails began to pour in from around the world! Although Sherri thought what she was experiencing was uncommon, they quickly discovered that Sherri was certainly not alone. In fact, people began thanking them for “putting into words what I was trying to say” to loved ones and they received story after story of spouses, siblings, friends and doctors whose relationships had been restored after going to the website. 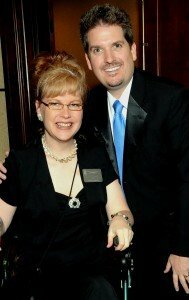 With a heart to help others like Sherri, Wayne founded the Invisible Disabilities Association into a 501(c)3 non-profit organization. Through Wayne and the IDA Team of business and medical professionals, IDA is encouraging, educating and connecting people and organizations touched by illness, pain and disability around the globe. This article was published in Your Hub. Denver Post. September 22, 2011. A Tribute to An American Heroine by Jeffrey H. Boyd, M.D., M.Div., M.P.H.